general processes of the economic cooperation of Russia with the CIS and enlarging EU. Preparing the information on the Bank for foreign partners and international organizations. Development of contacts with international organizations (Delegation of the European Commission in Russia, TACIS bank programs in Russia, European Business Club etc.). Control on the ICC Russia information activities. Development of contacts with other ICC National committees. Development of contacts with the Russian business organizations (Russian Federation Chamber of Commerce and Industry, regional Chambers of Commerce and Industry, Russian Union of Industrialists and Entrepreneurs). Analyzing of the development of the Polish economy (including agri-food sector). 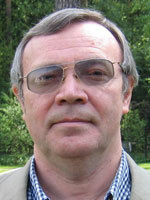 Assistance in realizing of business and scientific Russian -Polish contacts and cooperation. Lecturing in Political Economy and Economic History. Research and editorial work was concentrated on problems of development of agri-food sector in countries with planned economy, their position in solving the world food problem and trade and economic cooperation of the CMEA member countries in agri-food sector. Publications: 4 books(monographs) on economic and social problems of agri-food complex of the USSR and CMEA countries, including external economic relations and about 160 brochures, articles, reviews and references published in Russia and abroad. The economic relationship between Russia and Europe: current situation and emerging trends. In: “Russia and Europe: Putin’s foreign policy”. Stockholm, Swedish National Defence College, 2002. Rosja 2002: raport z transformacji (in Polish), co-author. Warszawa, Instytut Wschodni, 2002. Agricultural aspect of Russia’s accession to the WTO (in Russian). In: “WTO and Russian Agriculture”, Moscow, TEIS Publ.House, 2003. Russia and the Baltics:2010 (in Russian), co-author. Moscow, Foundation for Prospective Studies and Initiatives (PSIF), 2003.
International Chamber of Commerce: role in the international economic development (in Russian). “Russia and the contemporary world”, 2004, No.2. Central- Eastern European countries: problems of unification of agricultural policy model (in Russian). “Agrarian Russia”, 2004, No.4. Russia-Byelorussia economic relations and the interests of the Russian business (in Russian). “Carnegie Moscow Center. Working Papers”, 2004, No.9. Russia’s economic development: summing up the first presidential term of Vladimir Putin and prospects for the future. In: “Putin I and Putin II. Results of the first term and prospects for the second”. Stockholm, Swedish National Defence College, 2004. Articles “Agricultural Policy” and “Agri-industrial complex”(in Russian). In: “Great Russian Encyclopaedia”,Vol.I. Moscow, Great Russian Encyclopaedia Publ.House, 2005. The EU Common Agricultural Policy and new member-states (in Russian). “World of Changes”, 2005, No.1. Economic factors and trends of Russia –EU partnership development (in Russian). In: “Russia-Ukraine-European Union:Constructive Approaches for a Common Future”(Proceedings of the international “round table”). Moscow, PSIF and Friedrich Ebert Foundation, 2005. Social-economic development: Ukraine on the neighbors’ background (in Russian). In:“Ukraine-2006”, Moscow, National Institute of Corporative Reform, 2006. Articles “European Council” and “Common Agricultural and Fisheries Policy” in “European Union: facts and commentaries”, in Russian (Quaterly Bulletin of Institute of Europe RAS and Association of European Studies), 2004-2006. Contemporary trends of regionalization and Russia-EU cooperation (in Russian). In text-book: “World Economy and International Economic Relations”( to be published in September 2006). Moscow, Gardarica, 2006.